Please do come along and visit us at our booth nr. 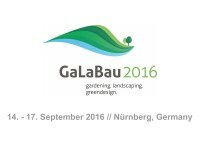 1-115 at GaLaBau 2016 – Nuremberg, Germany – to find out more about the solutions that we can offer. Our experienced team will be more than glad to talk you through our latest solutions. Make sure you don't miss the chance to meet them and have a deeper overview of our products.